Shibaguyz Designz is proud to announce we will once again be teaching at Knit Fit fiber festival right here in our home base of Seattle on November 8–9, 2014. This is our third year teaching at Knit Fit and this year we are bringing back one of our most popular classes as well as a new-to-Knit-Fit class! Affectionately known as 4F, this is one of our most popular classes. We start right at the beginning of garment design talking about how to look at a garment and see the basic shapes that make it up. Then we move on to fitting that garment to your specific body measurements, picking the right fabric (yarn and stitches), and, before you know it, you'll have a template you can use to create custom garments for yourself (and maybe even some for other folks… if they're lucky). It doesn't matter if you work with a hook or with needles for this one but there is a little bit of preparation to be done before you come to class so be sure to check out the class description on the Knit Fit website so you can take full advantage of the class. This will be our first time teaching this crochet class at Knit Fit and we just know it's going to be a lot of fun. If you look through my portfolio, you know I love motifs in just about every shape. The motif is, literally, a building block that has been used to create everything from couture garments to cozy afghans to a funky vest or boho skirt. There's just about nothing the mighty motif can't do! Our motif class starts with the very foundation of the motif and builds outward until we can turn a corner, round an edge, and even 3-D our way to motif madness! This ain't just granny squares! We will work on different ways of starting, building, finishing and joining motifs so your own motif madness will know no limits! 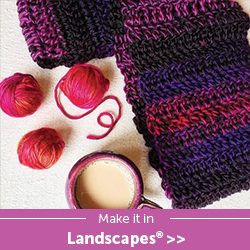 Check out the class description on the Knit Fit website and get down with your motif madness! Be sure to read the full descriptions for the classes on the Knit Fit website so you know what supplies and any pre-class preparation you might need to do. Registration starts August 1, 2014 so mark these pages and get in there before classes fill up. The class schedule can be found by CLICKING HERE. The full class descriptions can be found if you CLICK HERE. Look for our classes on Sunday and we'll look forward to seeing you at Knit Fit in Seattle! If you'd like to book Shibaguyz Designz to teach at your yarn shop, fiber festival, guild meeting, or for private lessons or one-on-one consultations, head on over to our CLASSES page and click on the Contact Us link. We'd love to bring one of our classes to you and we are always open to chatting about customizing a class just for you or your group.